Ministry of Propaganda - 03/Dec/2006: "Aldbourne Sunday Walk"
This morning I posted the hundredth entry on IslayBlog.com before tidying and cleaning the kitchen after yesterday's baking. Early in the afternoon it was time to decide where to go for a short walk. I opted for the short drive to Aldbourne for a look around. Two years ago I have been on a longer walk in the area, this time I only wanted a short walk. I parked at the village pond and walked over to the village square with the church. From here I followed the road on the right, which led me to the path for the Aldbourne Circular Route. I walked this path for a while for a nice view north east. The path was quite exposed and with a fierce cold wind it wasn't very pleasant, so I turned back after a while. Along a path over a field I left the hill and returned to Aldbourne. 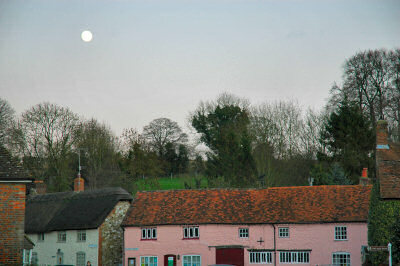 The moon was out, looking quite nice over some of the old cottages. 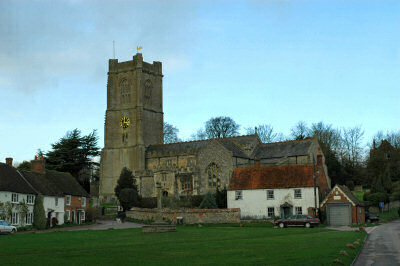 Another quick look around Aldbourne, then I drove home. A nice hot chocolate with a few biscuits my mother had sent me, then I was ready to write today's entry for the Sunday walk. Next weekend I plan to go on a longer guided walk, hopefully the weather will be nice.